Eliseo De León (front row, center) received the 2017 Advisor of the Year award from the Society of Hispanic Professional Engineers. He is surrounded by Iowa State delegates to the national SHPE conference. College of Engineering alumni and Iowa State adjunct assistant professor of food science and human nutrition Eliseo De León (Ph.D. mat sci & engr ’13) tells Iowa State students to find the “love of their life” in STEM studies. And De León is passionate about helping students find the spark and build the skills needed for successful careers. De León’s outstanding work with engineering students was recently recognized with the 2017 Advisor of the Year STAR award for the Society of Hispanic Professional Engineers and the organization’s national conference in November. “Dr. De León is truly a guiding light in all that is Latinx engagement within and outside of the state of Iowa,” said Jovani Rubio (mech engr ‘16) and a member of SHPE. Iowa State’s chapter of the Society of Hispanic Professional Engineers/Latinos in Science and Engineering has 120 members, with most meetings drawing about 40 active participants. “We try to recruit science and engineering students who are interested in Latino issues and in promoting the advancement of Latino families and Latino communities into STEM,” De León said. De León says that SHPE/MAES members are encouraged to push the boundaries and blow the minimum requirements out of the water, no matter their position in SHPE/MAES. “We’ve had some phenomenal leadership. Each president has stepped up and really demonstrated themselves to be responsible, civic-minded young people,” De León said. 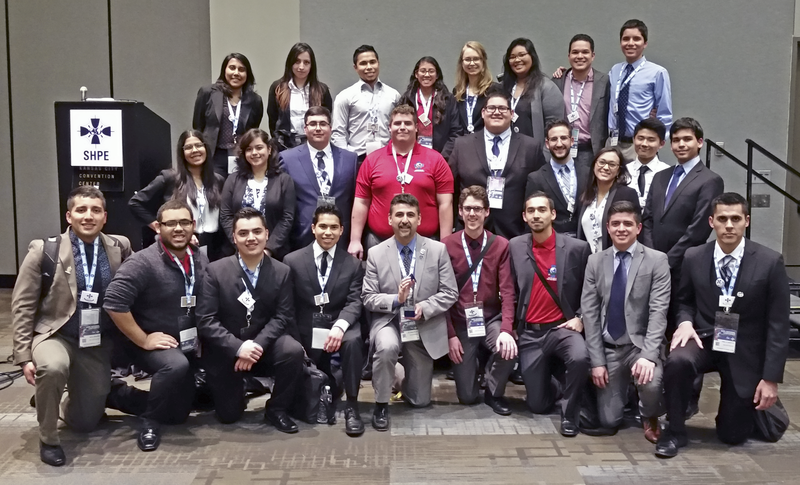 Iowa State’s SHPE/MAES presence is felt on campus, and at the national level too, with nearly 30 members attending the most recent national conference. “It was always the conferences that really brought me out of my comfort zone and challenged me,” Rubio said. Rubio was a member of SHPE/MAES and served as the vice president, regional leadership development conference sponsorship committee member, and several other roles. During Rubio’s final SHPE conference before graduation, a group of 10 participants were chosen to tackle a real-world example project, which helped him gain exposure to companies like General Motors. He is now working at GM in the Global Propulsion Systems Track Program. “Dr. De León’s involvement in my success at Iowa State goes much further than just being a mentor,” Rubio said. According to Rubio, when challenges were being faced at home, De León was there to listen and offer advice, so Rubio could continue his education to the best of his ability. SHPE/MAES also had a big impact on Marcos Cortes-Medina (mech engr ’17). Through a SHPE national conference, Cortes-Medina discovered an interest in Ohio State University’s graduate program, as well as a fellowship that will be funding his second year of graduate school, Discovery Scholars Program of the GEM fellowship. Cortes-Medina is now pursuing a Ph.D. in biomedical engineering, researching how mechanical properties of tumors influence cancer progression. “Dr. De León was there from the start. The role he played in my success was huge, from serving as a never-ending fountain of advice to providing recommendations for graduate schools, scholarship opportunities, jobs and even the National Science Foundation graduate fellowship,” Cortes-Medina said. De León is also an active participant in Iowa State’s chapter of SHPE/MAES meetings and events. He provides insight and a unique perspective on issues that the students may not have experienced before. De León contributes his success as an advisor back to the SHPE/MAES student members. A key component of SHPE/MAES is conducting outreach in underrepresented communities. SPHE/MAES members conduct STEM workshops and help educate Hispanic students and parents on what it means to have a college degree. “To me, it’s a very healthy way of participating as part of the community,” De León said. “Iowa State STEM students are there, face-to-face, especially the bilingual ones, delivering the message of the tools needed to rise everyone to the next level,” De León said. The most recent outreach opportunities included “Latino Family Visit Day” on the Iowa State campus, “Noche de Ciencias” at Harding Middle School in Des Moines and “MAES Science Extravaganza” at the Marshalltown Library. Joel Johnson, director of College of Engineering student services, says these collaborations have been key to building a stronger, more inclusive community of Cyclone Engineers – now and in the future.